This small residential hotel in downtown Vancouver was stubbornly saved from demolition by its amazing owner, the quietly determined George Riste. 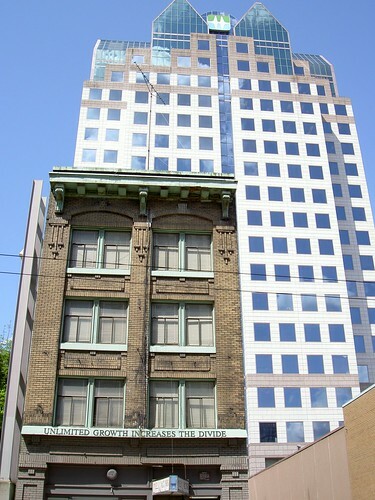 George resisted numerous attempts by BC Hydro to buy his building, continually asserting the rights of his tenants to remain exactly where they were. In the end, BC Hydro was forced to wrap its complex around George’s property and you can see the BC Hydro building above, towering over George’s Del Mar Inn.